Combine corn flakes, Parmesan cheese, and ranch dressing mix in a bowl. 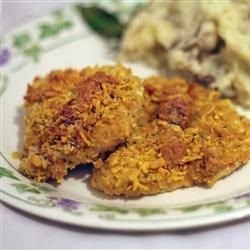 Dip chicken in melted butter; roll each chicken breast in corn flake mixture until evenly coated. Place coated chicken in the prepared baking dish. Bake in the preheated oven until chicken is no longer pink in the center and the juices run clear, about 45 minutes. An instant-read thermometer inserted into the center should read at least 165 degrees F (74 degrees C).